Pitlock has changed their standard packaging on most sets to include only one Pit. Until 2013 they included two pits, so you could keep a spare at home in case one was lost. Selling the sets with one Pit saves money. And since due to rising materials cost they would have to raise their prices, they decided to eliminate one Pit from the sets. However, I think this is not a good way to economize, and so we are ordering most of our sets with two Pits. This means we've had to raise prices. But I think it makes sense to have a spare Pit. If you would prefer to have your set with only one Pit, we can special order it for you. But I advise against it. We are stocking a few sets with just a single Pit. If possible, try to order everything you'll need for your bike at once. While we are happy to order extra parts by the same Pit code, it takes quite a lot of time for us. So we charge $ 16.00 per order when you specify a particular Pit code. That's not per item, but per order. So if you order several pits and skewers all with the same code, it's just the one $ 16.00 charge for everything. When you buy a Pitlock set, you must be sure to save the little card that has the Pit code on it. Without that code you cannot buy replacement parts with the same shape Pit. While we always record the Pit code when we sell a Pitlock set to a retail consumer, what will you do if we go out of business and our records are lost? It's your responsibility to record the Pit code so that if you ever want to add other coded parts to your set or replace lost coded parts you can do so. 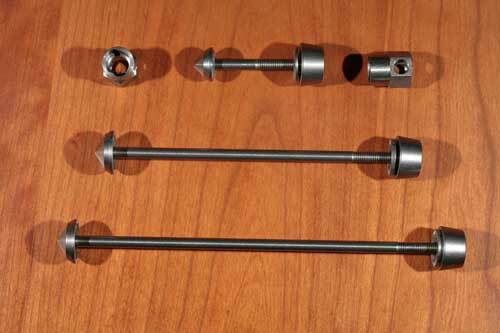 Pitlock makes locking skewers for bicycle hubs with hollow axles using 5mm diameter skewers. This is the most common type of axle on bicycles not sold at department stores such as Walmart, Kmart or Sears. If you bought your bike at a department store, it's not worth protecting with Pitlock, and Pitlocks probably won't work on your bike. Set 02 for wheels and seatpost binder. Some bicycle wheels are pretty expensive. You can easily pay $700 for a set of racing wheels or heavy duty touring wheels. A front wheel for a dynamo lighting system can cost well over $400. A Rohloff 14 speed hub alone will set you back $1,700 or so. While most bicycle thieves don't know the difference between a SON hub and a Wald steel bolt-on hub, they do know that a bike with generally high quality components will have expensive wheels. And if you ride a bike to work with a dynohub (and of course you should you know) your wheels could be at the mercy of every potential thief walking past the bike rack outside the building where you work. Pitlock is a complete system of skewers and bolts for many of the expensive components of your bicycle. For example, your wheels are generally held onto your bike with quick release skewers. If you leave your bike unattended with just the frame locked, it takes only seconds for a thief to steal your wheels. If your bike has an expensive fork, it can be stolen with a 5mm allen wrench. Just undo the bolts holding the stem on your threadless fork, and the fork drops right out of the frame. Your seat post with saddle attached can also be stolen either by flipping open its QR, or loosening the 5mm allen bolt. Expensive brakes can also be stripped from a bike with nothing more than a 5mm allen wrench. You can remove your front wheel, place it alongside your rear wheel and then lock your bike to some lamp post with a big heavy "D" lock. But that limits you to only certain locations to lock your bike, locations with a suitable pole and free space surrounding it. And it means having to remove that front wheel, which may have an expensive dynohub with wiring attached, fender with a mudflap attached that can get mangled while resting on the ground, and it means your "D" lock needs to be large and heavy. With Pitlock, you can use a much smaller lock to just lock your frame or a wheel to something immobile, giving you many more options for locking your whole bike. Nut end. The skewer shaft is extra long for thick dropouts. Pitlock skewers make it very difficult for a thief to steal your wheels, seat post, even your threadless fork and brakes. Pitlock replaces your hub's quick release skewers, brake fixing bolts, 1 1/8" threadless headset top bolt and cap, seatpost fixing bolt, and even replaceable rear dropout bolts with special bolts that require a special stainless steel key or "Pit" wrench to open. 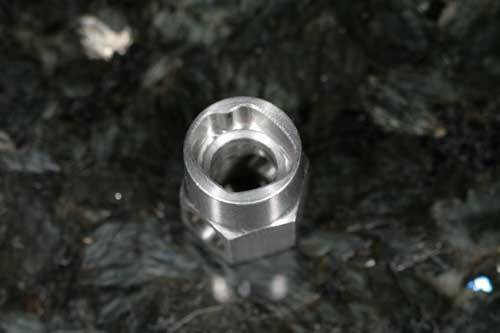 The locking nuts can't be opened without one of over 1,000 individually shaped "Pits". 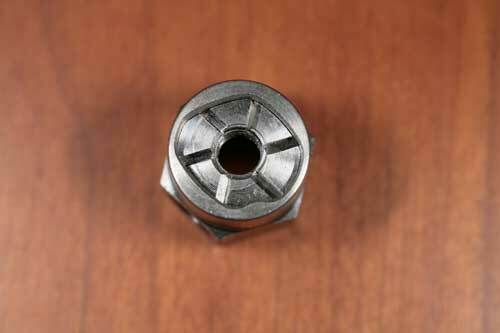 Ordinary wrenches can't grab onto the specially shaped nuts and bolt heads making up the Pitlock system. Only the included Pits can engage the heads. And there are over 1,000 different shapes to these Pits, nuts and bolt heads. A thief would have to make a huge investment in Pitlock sets in order to have a good chance of having the correct Pit for your Pitlock set. You can buy a complete set of Pitlock skewers and locking bolts, or you can buy just a single Pitlock item now, and add more later if needed. For some people, the only high value item on their bike might be a Schmidt SON dynamo hub in their front wheel. You can buy just a front Pitlock skewer for it, or you can get a set with a front skewer and a seat post binder bolt, or with a rear hub skewer. In the image above, notice that the bolt is extra long. Some binders require longer bolts than others. Once you know how long yours needs to be, cut it to the desired length. If you know how long you want it when ordering, tell us and I'll cut it for you. The Pit is hollow so you can tighten it with the bolt at full length. The bolt will simply extend out the end of the Pit. If your frame has a seat post collar that isn't an integral part of the frame, in other words, if it's a separate clamp that wraps around the top of the seat tube and clamps the tube tight to the seat post, you should check it to see if it has flat surfaces for the clamping bolt. If it does, the Pitlock seat post binder will work. 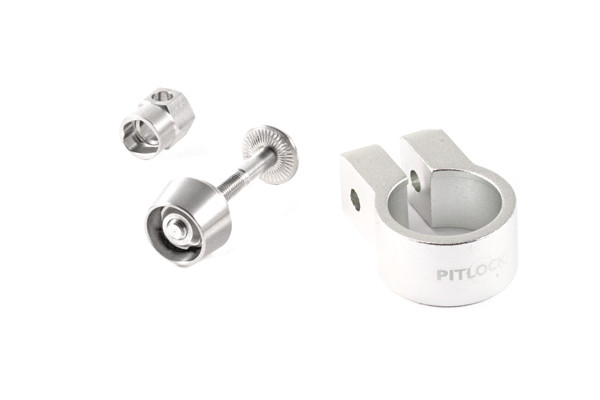 If it doesn't, Pitlock makes clamps that are suitable for the Pitlock binder bolt. Measure the outside diameter of the seat tube, not the seat post, and we can sell you the correct size clamp. We stock these in silver and black. Once you buy a set of skewers, say for your hubs, if you want to add a lock for your threadless stem, you simply provide us with the Pit code which is supplied with your first set and we'll sell you a threadless stem lock that works with your original Pits. That way you can have just two Pits for most of your Pitlock products. You get two Pits when you buy most Pitlock sets. Keep one with your bike (but not on your bike when you park it) and the other at home. These skewers will replace any standard 5mm (the industry standard) hub quick release skewer, regardless of brand. 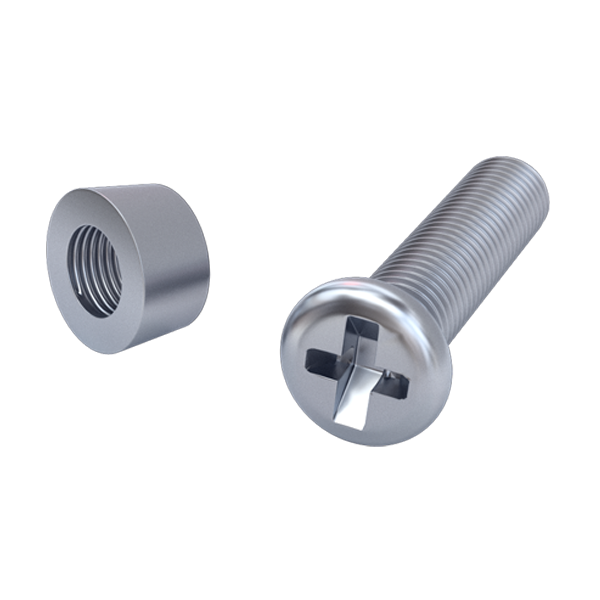 The Pitlock seat post bolt will replace most external seat post binder bolts and is compatible with many loose locking collars. Seatpost Binder with Pit inserted. Pitlocks come in a variety of sets. There's a set that includes two Pitlock skewers (and two Pits) for your hubs. That's set #03. I don't know why. I'd have made it Set #01. But Set #01 has a front hub skewer and a seat post skewer (and two Pits). Set #02 has front and rear hub skewers and a seat post skewer along with the two Pits. Set #04 is for just a front hub skewer and #05 is just a rear hub skewer. Most sets include two Pits, the tool you use to tighten or loosen your Pitlock device. Unless the description states otherwise, you get two so that you have one to keep with the bike, and a second for a spare. The Pit takes the place of an allen wrench or the lever of a hub quick release. The Pit engages the nut or bolt head of the Pitlock device, and no other wrench can engage that nut or bolt; it will just slip off. 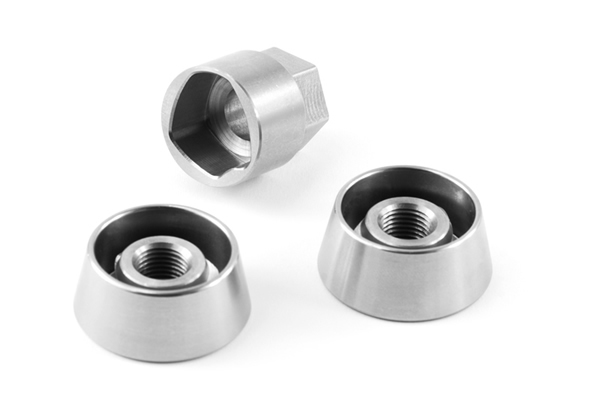 You can't even get vise grips around the Pitlock nuts since there's a very tough, free spinning and tapered stainless steel cover surrounding the nut. The special Pit fits in between that tapered cover and the nut or bolt head, and there are over 1,000 different shapes to these Pits. You need either a 14mm box end wrench, or any strong rod 5mm or smaller in diameter to hold and tighten a Pit. A 5mm allen wrench or most screw drivers will fit nicely into the hole in a Pit to use as a wrench to get leverage on it. Use a toothpick to spread a bit of grease onto the threads inside the nut. 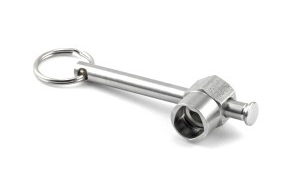 The stainless nut on the stainless shaft can bind and break the shaft without lubrication! Nut inside the Pit, a lovely tight fit that won't slip. The Pits are all coded with a number which you'll get with your first Pitlock set, regardless of which set you get. Any future Pitlock devices you buy should be bought using that number, so that the Pits you got with your first set will fit the new devices. There's no need to have extra Pits that are incompatible with your other Pitlock devices. In the image above, notice that the nut is inside the tapered safety ring. If a thief wants to grab onto the safety ring and turn it, it would do him no good, and in fact it will spin freely. The nut is inside the safety ring. The safety ring prevents anything except the Pit from contacting the nut and turning it loose. If you buy a set of hub skewers, Set #03 and then add a seat post skewer later, you'll pay more than if you buy the Set #02 and get the two hub skewers with the seat post skewer. And you don't want to buy a Set #03 and then later buy a Set #06. A Set #06 is the seat post skewer and two Pits. But the Pits will probably not fit your hub skewers, unless by pure chance they happen to have the same number. When you want to add additional locking skewers for more parts of your bike, remember to order them by the Pit key code of the first set you bought, then your Pits will fit all of your Pitlock devices, and you won't be paying for more Pits. If you're planning on getting set #03, which has two skewers for your wheels, you should give serious consideration to set #02. It's just a little bit more money, and it protects your seatpost, and perhaps your saddle. It takes only a few seconds to loosen a seatpost binder bolt with either a QR lever or a 5mm allen wrench, and the post slides right out. So for not much more than the cost of the Pitlock hub skewers, you can also protect the seatpost as well. But only if your frame is compatible. Will the Seatpost binder fit? In order to work properly, the Pitlock seatpost binder needs two flat surfaces. Your existing seatpost binder bolt can't be recessed into the frame. Some frames use a separate seatpost collar. Some frames have the hole for a seatpost binder incorporated in the frame itself. Take out the bolt, and look at the hole that the bolt goes through. If at each end of the hole there's a flat surface for the Pitlock binder to press against, you're all set. If not, and the frame has the hole as a structural part, you shouldn't use the Pitlock. If you have a separate collar, Pitlock makes collars that have flats on each end and are fully compatible with the Pitlock seatpost binder. We have them for various diameter seat tubes and in silver and black finish. Just measure the outside diameter of the seat tube of the frame, not the seat post. I place orders to Germany about once every other month, so if you do need to add a Pitlock device to work with your existing Pits, it won't take very long to get them. Of course if you're just starting out, I have a large inventory so you shouldn't have to wait at all. Since stainless steel can be sticky against other stainless parts, you must grease the threads of the Pitlock skewer shaft when assembling. 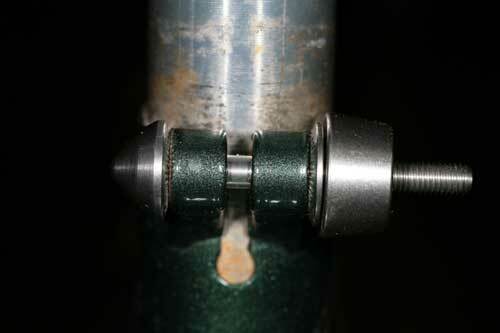 Make sure that the thread on the shaft as well as inside the nut is greased. Use a toothpick to get grease into the nut's threads. And it's very important, if you have a SON hub, to grease it after putting the skewer through the SON hub. Too much grease inside the SON axle can clog the vent hole in the axle. So, put the skewer through the SON hub, and then put a little spot of grease on the threads. No system is perfect. For most older bikes, Pitlock won't completely prevent front wheel theft. For example, if your fork has a threaded steerer, meaning that your stem inserts into the steerer, your front wheel can still be stolen if the thief can remove the stem from the steerer (usually with a 5mm allen wrench) and if he can take apart the headset. That requires a large wrench, typically one that's 32mm across, to remove the top half of the headset. Certainly it would take a while and the thief couldn't accomplish the task discreetly. Then the thief could remove the fork from the frame with the front wheel attached. He'd then have to do some serious work back in his shop to get the wheel off the fork. So, it's not perfect protection, but it's far better than most alternatives. However, if your bike has a threadless steerer, as most bikes made in the past 25 years do, the fork can be removed from the bike by simply loosening the stem with an allen wrench. So it's critical that you protect the top cap. So if you have a threadless steerer, make sure that whatever set you get, if it's protecting the front wheel, it must also protect the headset. And that means buying a set that includes "GA" in the name. Resist the temptation to make the Pitlock as tight as you can get it. You don't need to lean on your wrench to make the Pitlock hold your wheel securely on your frame, provided you're using vertical dropouts. See the paragraph on horizontal dropouts below. If you clamp the Pitlock too tightly, you can break the skewer shaft. Just put a spot of grease on the thread and tighten the Pit firmly. It's designed not to loosen up while you're riding, so you don't need all of your strength to make a safe connection. I don't recommend a Pitlock rear skewer if your frame has horizontal rear dropouts. 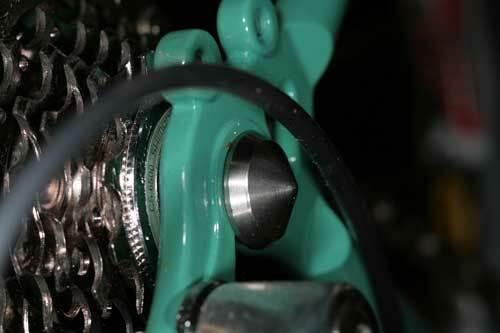 Horizontal dropouts require very high clamping force, otherwise the wheel will slip forward in the right dropout. Pitlocks are designed for vertical dropouts, which do not require high clamping force. The Pitlocks can't produce enough clamping force for a horizontal dropout. Think of them as comparable to aluminum QR skewers, which, as most people now know, can't be used with older bikes having horizontal dropouts. But with vertical dropouts, Pitlocks will hold your wheel quite securely in the frame. Don't worry. All set prices include one or two Pits and a code. If you already have a Pitlock product and know the Pit code, you can order additional components to match the Pits you already have. To order parts by your existing Pit code, scroll down beyond this section to the Parts Prices section. There is a $ 16.00 surcharge when ordering parts by a specific Pit code. Unless otherwise noted, all skewers are in normal stainless steel finish. Set #01: Includes front hub skewer and seatpost binder for external binder bolts and two Pits with serial number. Set #01 Black: Same as above but with black finish. Set #01GA: Includes front hub skewer, seatpost binder for external binder bolts, Aheadset top cap and bolt for 1 1/8" threadless steerer and two Pits with serial number. Please specify Silver or Black top cap. Set #02 Black: Same as above but in black finish. Set includes front & rear hub skewers, seat post bolt, and Aheadset top cap and bolt. 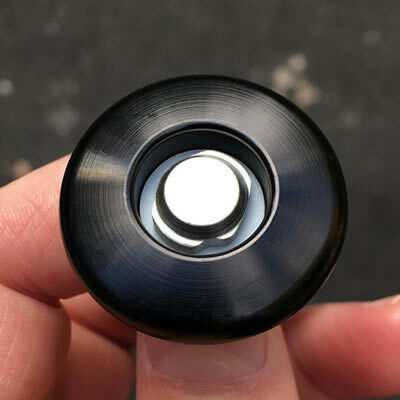 If your bike has a threadless steerer, as most modern bikes do, you need the Aheadset cap and nut. That's the "GA" part. Otherwise your front wheel can be stolen by removing the fork, which takes only a few seconds. Set includes front & rear hub skewers, seat post bolt, and two brake bolts for cantilevers or V brakes. Set includes front & rear hub skewers, seat post bolt, Aheadset top cap and bolt and two brake bolts for cantilevers or V brakes. 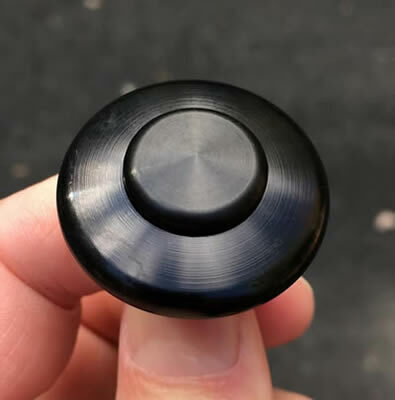 Unless you specify otherwise, the Aheadset cap will be for a 1-1/8 steerer. We have both 1" and 1-1/4" available. Just let us know. Set #02/GA/Disc4/LH45: adds 4 Disc Caliper bolts, and adds bolts to secure any Busch & Müller or Schmidt dynamo headlight with its mount to the fork crown. We use this set on our Tout Terrain bikes. You need four brake bolts on most bikes with disc brakes. 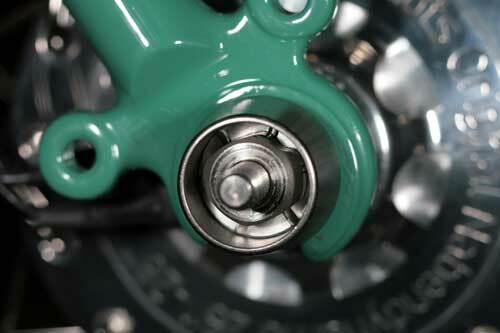 Most bikes use adapters between the frame and the disc caliper. So you replace one of the standard bolts holding the adapter to the frame, and one of the standard bolts holding the caliper to the adapter. If your caliper is mounted directly to the frame, you only need two of the bolts. We can create a set with just the number of bolts you need for your bike, and it will be priced accordingly. Set #02/AUS includes front & rear hub skewers, seat post binder and dropout. Set #03: includes two hubs skewers, front and rear, and two Pits. Remember that if your bike has an Aheadset or threadless steerer, your front wheel can be easily stolen by removing the fork. You should consider buying the Set #03/GA instead. See below. Set #03 Black: Same as above but with black finish. Set #03/GA adds an Aheadset cap and nut to the set #03. Be sure to specify 1", 1-1/8" or 1-1/4" steerer. This does not include a seat post bolt. Does include 2 pits. This does not include a seat post bolt or an Aheadset bolt and cap. Includes hub skewers, Aheadset cap and bolt, and headlight mount bolts for Busch & Müller or Schmidt headlight and mount. Measure the total thickness of your fork crown and any hardware you're attaching, like the headlight mount. The last 2 digits (33) is the length in millimeters that the bolt will accommodate, not the length of the bolt itself. Set #04: Includes one front hub skewer and two Pits. Set #05: Includes one rear hub skewer and two Pits. Set #06: Includes one seatpost binder bolt and one Pit. Set #07: Includes one rear hub skewer, a seatpost binder bolt, and two Pits. Set #08: Includes one bolt set for dropout and one Pit. Set #09: Includes Aheadset top cap, special bolt and one Pit with serial number. The standard version is for threadless headsets on 1 1/8" steerer tubes. If you have a 1" threadless or a 1 1/4" threadless, let us know and we'll get you the correct size. There is no Pitlock for old style threaded steerer tubes. If your stem inserts into the steerer, you have the old style. But that also means you don't have the security problem introduced by threadless steerers. Most headsets for threaded steerers require special tools to take apart, so your fork is relatively safe. 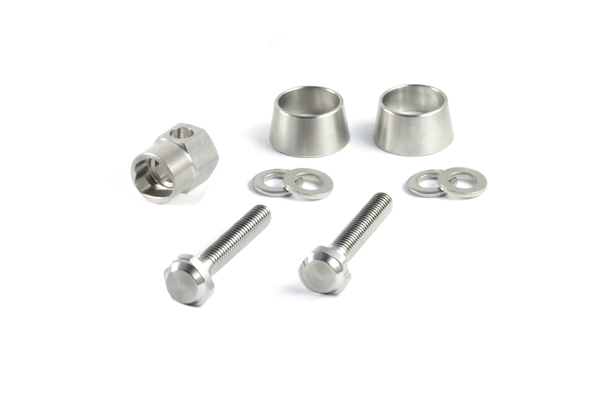 Set #10: Includes two special bolts for canti brake studs and one Pit with serial number. Set #11S includes one bolt for securing a disc caliper to the frame. One Pit. Set #11D includes two bolts for securing disc calipers to the frame. One Pit. Set # 14, "Saddle Direct" blocks access to the saddle clamp bolt on many seat posts. It's a seat collar, Pitlock closure and rubber shim. Once tightened to the seat post, you can't access the bolt holding the saddle to the post. Three sizes for various seat post diameters. Pitlock makes several sizes of seat post clamps; 28.6mm, 31.8mm and 34.9mm. And for Surly frames, they make a 30.0mm version which consists of the 34.9mm clamp and a shim to fit the 30.0mm outside diameter of Surly frames. It's important to understand something here. The seat post clamp size has nothing to do with the seat post diameter. The seat post is inserted into the seat tube of the frame. The seat tube has some thickness, which varies from frame model to frame model, depending mostly on the frame tubing material. An aluminum seat tube with have thicker tubing than steel, for example. So, when deciding which Pitlock seat collar to buy, please ignore the seat post diameter as it's irrelevant. Please measure the outside diameter of the frame's seat tube where the clamp will be. For Rohloff with solid axle, not QR or hollow axle. Also works with any 10mm x 1mm threaded axle such as NuVinci n360 and Miche Primato Pista rear, SRAM Automatix and SRAM DD3. What does that mean, Peter? It means the outside diameter of the axle is 10mm, and the distance from thread to thread (the thread pitch) is one millimeter. So if you take your metric ruler and lay it along the threaded axle, at every one millimeter marking, there will be the tip of the thread touching the ruler. Set M10 is a different type of Pitlock, made specifically for those Rohloff hubs having a solid axle. The Rohloff is available with either a hollow quick release axle, or a solid axle. 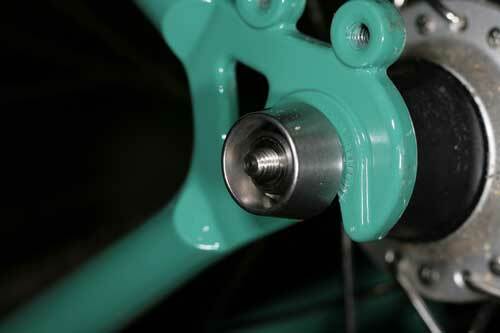 The solid axle version is recommended for bikes with old style horizontal dropouts, like the Campagnolo 1010 dropouts. Since the nut for a solid axle has to be much larger than the nut for a skewer, the Pit code for the M10 is not the same as for other Pitlock skewers. While the design philosophy and materials are the same, you will need to carry a different Pit for the solid axle M10 than for a front quick release hub, or brake or headset. Also, the M10 only works with certain hubs. The Shimano Nexus hubs use a 9.5mm axle, not the 10mm axle used by Rohloff, so don't try to use the M10 with a Shimano Nexus hub. The M10 comes with two coded nuts, collars, notched washers and one Pit. Remember, this is only for certain hubs with solid axles. Hubs with hollow axles use normal skewers, therefore they use the Pitlock skewers. Set #SH38 is for the Bolt-On Alfine and Nexus rear hubs. The "Double" version gives you two Pitlock nuts, one for each side. You only need one to prevent the theft of your rear wheel but having Pitlock nuts on both sides will frustrate thieves so much, their heads will explode. And what could be more entertaining than that? Also, if you use only one Pitlock nut, you'll need two wrenches to remove your wheel; the 15mm wrench for the axle nut Shimano uses, and a 17mm wrench for the Pitlock. Better to carry just one wrench, I think. Not compatible with Dura Ace track hubs since the axle has a different thread. Same as above but just one nut to save money. 17mm wrench flats. Set #SH90 is for the Bolt-On Shimano front hubs with 9mm axles. The "Double" version gives you two Pitlock nuts, one for each side. You only need one to prevent the theft of your front wheel but having Pitlock nuts on both sides will frustrate thieves so much, their heads will explode. And what could be more entertaining than that? The Pit Tool is a handy way to keep your Pit with you and gives you enough leverage to tighten or loosen your Pitlocks as needed. Pit Stopper is a little cylinder, with a slight conical profile that you hammer gently into the hex head of an allen screw. This prevents an allen wrench from engaging the screw. Why is this useful, you ask? I'm glad you asked. Bike thieves often carry allen wrenches with them, which make it easy to steal parts from parked bicycles, like saddles, brakes or handlebars. 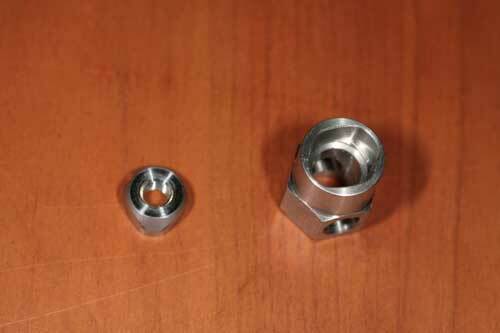 These components, on modern bikes, are very often secured with allen bolts, and are easy to steal. By inserting a Pit Stopper in the head of the bolt, you can make it far more difficult for the thief to steal your bike parts. But Peter, what if I want to adjust my saddle or handlebar, you ask? Glad you asked. Pit Stopper comes with a little screw. When you thread that little screw into Pit Stopper, it acts like a bearing puller once it reaches the bottom of the allen socket, pulling Pit Stopper out of the allen bolt. Now you can adjust your handlebar again. Each Pit Stopper comes as a set of two with one removal screw. You use a philips head screw driver for the screw. 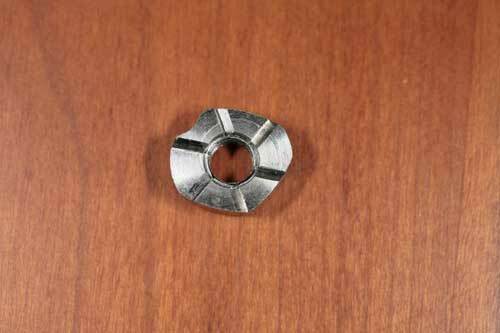 The Pit Stopper sizes are given for the typical bolt thread of an allen cap screw. For example, an M5 thread cap screw has a 4 mm allen socket. So you would buy the Pit Stopper M5, even though the allen head size is 4mm. M5 refers to the 5mm metric thread of the screw, not the allen socket. So it's a bit confusing. For example, screws come with a variety of heads. A cap screw with an M5 thread will typically have a 4mm allen socket. But a button head screw with the same M5 thread will have a 3mm allen socket. Please read the descriptions of the various Pitstopper versions below before ordering! Notice that the name of the Pitstopper (for example M6) refers to the THREAD DIAMETER of a typical allen cap screw. 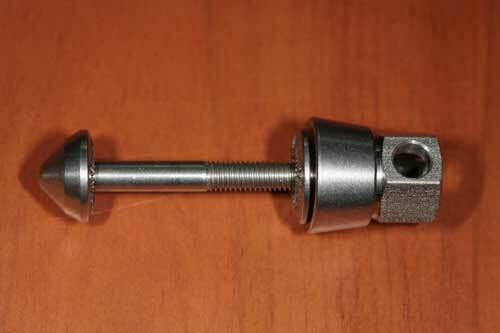 For example, a typical allen cap screw with a 6mm diameter thread uses a 5mm allen wrench to tighten or loosen. So, the name of the Pitstopper DOES NOT refer to the size of the allen socket on the screw! AND, it will not always correspond with the thread diameter. 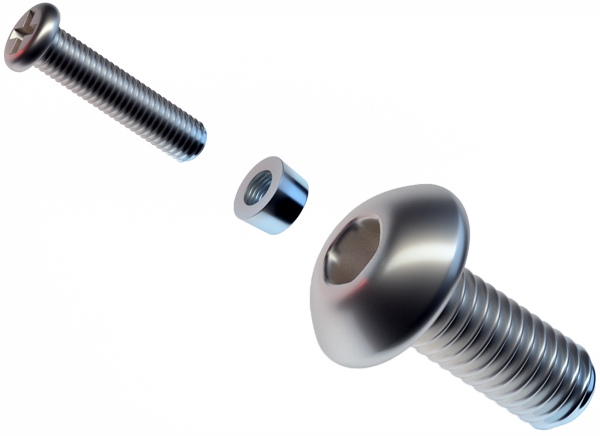 For example, a button head screw typically uses an allen socket 1mm smaller than the socket size on a cap screw with the same thread diameter. You must read the descriptions. These parts all need to be ordered by your Pit code. If you don't already have a Pitlock product with a code, you need to scroll up to the section right above this section and order a Set. Additional front or rear hub skewer. $ 33.00 We have these for front and rear hubs. The rear hubs can use any axle length up to 145mm. Please specify your rear axle length so we give you the right skewer. We also have a way to fit these to Santana's 160mm rear hubs, but it costs a bit more. Additional Seat Post binder. Same price as above. Note: Cover Caps are not included in Pitlock Sets. They are for cosmetic purposes only. They thread onto the skewer outside of the coded nut, and give the nut end of the skewer a similar appearance to the opposite end. If you break or otherwise damage just the skewer shaft itself, and the rest of your hardware is fine, this is what you need. Order by the outside diameter of the steerer tube. There are three sizes. 1 1/8" is by far the most common. Well, that's a mouthful. You can cover the bolt head with this. Without Cover Cap on the left, with Cover Cap on the right. If you're feeling adventurous, you could impress your friends by having a Silver Cover Cap on a Black headset cap! Many more items available. Check back! We'll keep a record of the Pit code for your set. It will be included with your invoice, and on our copy of your invoice in our computer database. So even if you lose the code, and your invoice, we'll be able to provide you with additional components which fit your existing Pits. And, should you lose your Pit or Pits, with that code we'll be able to sell you replacement Pits. So you don't need to worry about your investment should you lose your paperwork, or your Pits. Extra components with matching Pit codes can take a month or two to bring in from Germany. 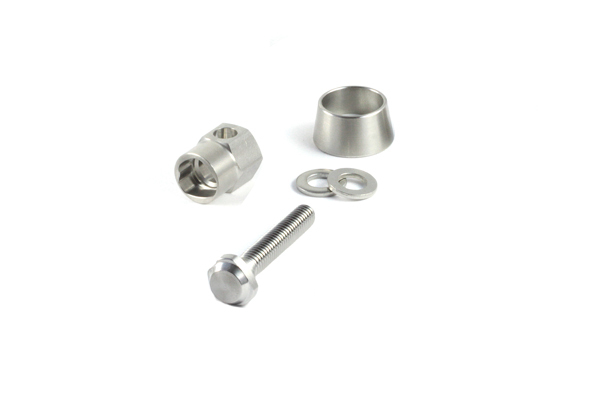 I'll be placing orders about once a month for additional coded Pitlock parts. If you purchase your Pitlock set through your local bike shop, we'll have no way of knowing what your Pit code is. But as long as you keep that number you're all set. Call us at 603 478 0900 to order directly from Peter White Cycles. See this page for a list of local bicycle shops that generally stock our products, or can order them for you. If there's no shop in your area, you can of course order directly from us.